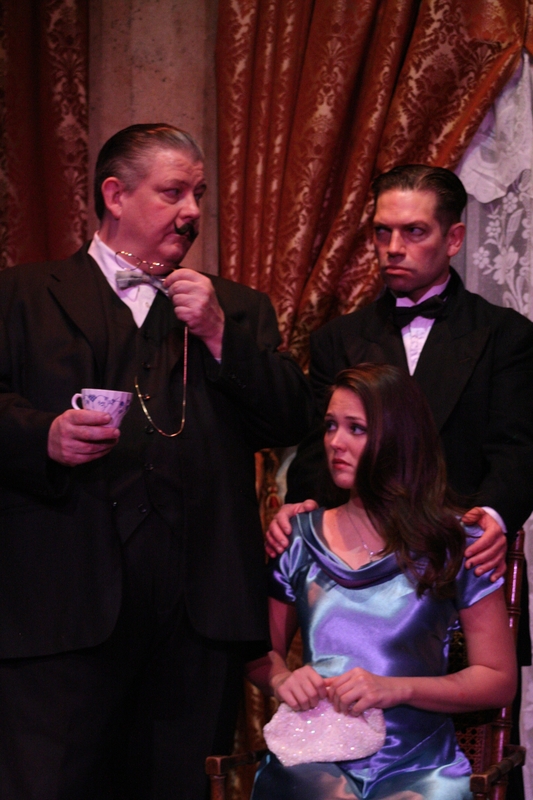 Continuing its 2011 summer repertory series, California Theatre Center (CTC) adds “Agatha Christie’s Black Coffee” to the mix. Originally written as a three-act play by Christie in 1930, and incidentally the only Christie play featuring her indelible detective Hercule Poirot, this is a production not to be missed. While it’s a little formulaic as part of the murder mystery genre, Poirot’s application of his “little gray cells” and gentle humor keep the audience enthralled through his final resolution. The story is set in 1934 as Poirot is summoned to Abbot’s Cleve, England by Sir Claud Amory, a famous physicist attempting to protect his latest discovery – the formula for a new explosive critical to England’s defense. Amory is an ornery braggart, conceited, and mean spirited, and in this genre, his fate seems sealed when we first meet him. He wants Poirot to take his formula and deliver it to the Ministry of Defense, but before Poirot arrives, the formula is stolen from Amory’s safe. Amory immediately lines up his family, house guest, and staff in an attempt to get it back. He imprisons everyone in the library, and at the appointed time, has Tredwell, his trusted butler, shut off the lights so that the thief can return the formula anonymously in the darkness. Although when the lights come back on an envelope sits upon the table, Amory is slumped back in his chair, dead. The question is, did he die of natural causes, or was he murdered? And as a side note, does the envelope still contain the formula? If Amory was killed, there are certainly enough suspects to go around. His son Richard has been bullied by his father for years, harassed about his debts. Richard’s wife, Lucia, is an Italian emigrant and a bit of a mystery, but she also has reason to be unhappy under Sir Claud’s thumb. Sir Claud’s sister, Caroline, resents her brother’s overbearing posturing, and his niece, Barbara, is a free spirit, also unhappy about his tyrannical reign. Tredwell appears loyal, as does his secretary Edward Raynor, but are they really? And then there’s Dr. Carelli, an Italian house guest and acquaintance of Lucia’s. Of course, Hercule Poirot, arrives with his friend and associate, Captain Arthur Hastings, shortly after Sir Claud is found dead, but he’s clearly too late to take his instructions from Sir Claud directly. The remaining characters include Dr. Graham (Amory’s personal physician), Inspector Japp of Scotland Yard, and Constable Johnson. It would give away far too much to further elaborate on the plot, except to say that for the keenly observant audience member, all the clues needed to solve the case are betrayed even before Monsieur Poirot’s arrival. CTC does a credible job bringing this play to life, again building off of Michael Cook’s single set utilizing the same archway/column arrangement seen in “80 Days” and “The Servant of Two Masters”, this time forming the foundation of the library – with fully loaded bookshelves in the upstage left corner. The remaining accoutrements charmingly accent the room from the central chandelier, down to the rugs (which created a trip hazard, late in Act 3 during the 7 July performance), and fireplace. The French windows, upstage right, also provide a nice entrance point to the library (in addition to two working doors and an open doorway to the offstage study), and afford a location for a rather comical Act 3 chase to ensue. Director Will Huddleston’s casting choices work well for the most part, particularly Charlie Shoemaker’s continuation of a summer playing eccentric detectives following his Detective Fix in “80 Days”, this time as Poirot, nicely capturing his character’s eccentricities and genius. Shoemaker’s easy manner and solid delivery are enjoyable to watch; his character’s obsessive neatness, straightening objects in the library, is both very natural and rather amusing at times. He has good chemistry with his cohort, Daniel Joyce as Hastings, as they banter playfully off of one another. Noel Wood and Jenna Pinchbeck as Richard and Lucia Amory make a nice pair. As the recently married young lovers in this piece, they capture their characters’ accents and moods realistically, and they too have good chemistry in their interactions. Justin Karr’s Dr. Carelli is entertaining and a little unsettling at times. While he hits the Italian accent convincingly for the most part, at one point he sounds almost Russian. Rick Haffner’s Sir Claud Amory sets the tone, and while short lived, only lasting through Act 1, he strikes a commanding presence and makes a deep impression. Stefan Fisher as Edward Raynor and Thor Bautz as Tredwell also work well. They serve their master attending to the details required, and later help the authorities as the case unfolds. Tredwell is a little stiff and very proper as written, and Bautz maintains his comportment appropriately. Raynor is written with a little more depth, and Fisher is believable and natural in his delivery. Michael Detmer’s Dr. Graham, Ben Brotzman’s Inspector Japp, and Nick Erickson’s Constable Johnson are all acceptable though a bit weak in their dialect, all playing fairly minor roles, but interacting with Shoemaker and others appropriately. There’s one very funny chase scene in Act 3 when Poirot hands Johnson an unlikely weapon which Johnson first uses to subdue a suspect then nonchalantly returns. The production isn’t perfect, and the problem areas aren’t horribly egregious, but there are a few small difficulties. First, Kelly Caitlin Sullivan reads too young for Caroline Amory. She’s supposed to be a contemporary sister of Sir Claud’s, but she reads almost a generation his junior. Second, Corinne Bupp’s Barbara Amory, though she has good chemistry with Hastings, reads too stiffly for a character who’s supposed to be looser and more “modern”, and she also has some dialect issues. Lastly, there are a few places where various actors trip on their lines a bit, but being a repertory series that can be forgiven to some extent, and all cover well. The bows are entertaining and nicely staged as a montage of the story. They creatively serve as a suggestion in case you missed a major point during the play. The gramophone scoring at the top of each Act is a nice touch as well, setting the mood and providing a remembrance of the time. A final note, the 7 July performance was a special night when the CTC advanced conservatory students were given the opportunity to come see their instructors perform in this production. One performer in particular can relate to both sides of that equation. Noel Wood started out as one of those CTC conservatory students, lo, those many years ago. A satisfying evening’s entertainment, “Black Coffee” continues through 24 July in rotation with the rest of the summer rep series. All performances are held at the Sunnyvale Theatre located at 550 E Remington Drive, Sunnyvale, CA 94087. Single tickets range from $10 – $25. Discounts are available for students, seniors and groups of 6 or more. For tickets and more information, call the CTC Summer Rep Box Office at 408-720-0873, or visit www.ctcinc.org. Thanks for some wonderful reviews this summer Ande. I hope you enjoyed all the shows and can come to some of our young audience plays this year. Thank you for all you do to promote local theatre! Excellent read, I just passed this onto a colleague who was doing some research on that. And he just bought me lunch since I found it for him smile So let me rephrase that: Thank you for lunch! “England and America are two countries separated by the same language.” by George Bernard Shaw.